Over the past ten years there have been a large number of publications that have described hundreds of quantitative trait loci (QTL) in livestock species. To facilitate the comparison of QTL results across experiments, the Animal QTL database (QTLdb) was developed to house all published QTL information as a public repository. The QTLdb was originally developed to serve the porcine genomics community (previously known as PigQTLdb). We have further developed the QTLdb to house QTL data from multiple species, including but not limited to cattle, chickens, and pigs. In addition, tools have been developed to allow QTL map alignments against consensus linkage maps, radiation hybrid (RH) maps, BAC fingerprinted contig (FPC) maps, single nucleotide polymorphism (SNP) location maps, and human maps. In addition, we have expanded the capabilities of the database such that research tools were developed where “private” preliminary QTL data could be entered and compared against all public data. This allows researchers to visualize data before publication and compare it with published results to aid in data interpretation. 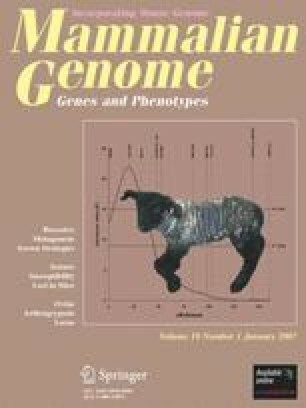 To serve this purpose, the database curator/editor tools also include functions that allow registered users to enter their own QTL data, make use of the QTLdb tools for data analysis, and use the QTLdb as a publishing tool (URL: http://www.animalgenome.org). The authors express their appreciation to Stacey Meyers, Jonathan Beever, Denis Larkin, and Harris Lewin from the University of Illinois; Sean Humphray, Carol Scott, and Jane Rogers from Sanger Institute; Max Rothschild, Behnam Abasht, and Susan Lamont from Iowa State University; and Martien Groenen from Wageningen University for various data and their generous help. They have greatly accelerated progress on this project. The authors are also in debt to Eric Ryan Fritz for his diligent effort as a data curator.